Having a few alterations you can do yourself is a pretty valuable asset. Even having fake alteration assets is great, like how I take in sides, along the entire length, of a pair of pants or a skirt; I'm mostly guessing but it usually turns out good enough. But being able to properly take in a hem, is on the top of the altering-assets list. In this post I talked about taking in the hem of skirts with a blind stitch, and today taking in jeans using the original hem. There is such a difference in using the original hem versus creating a new hem on your own -- you're never going to get your new hem to look like the manufactured hem and, I think, that's quiet distracting and you might as well walk around in pants too-long. Plus, it's so easy to use the original. Tutorial after the jump! 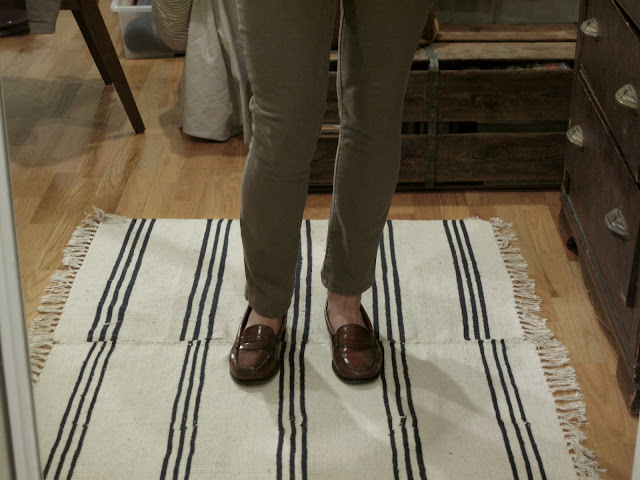 On these pants I actually took in both the hem and sides to turn them from too-long-bootcut to just-right-skinnies, but I'm just going to talk about the hem in this post. Cut off the original hem giving yourself a generous 1/4" or 1/2" from the stitching. 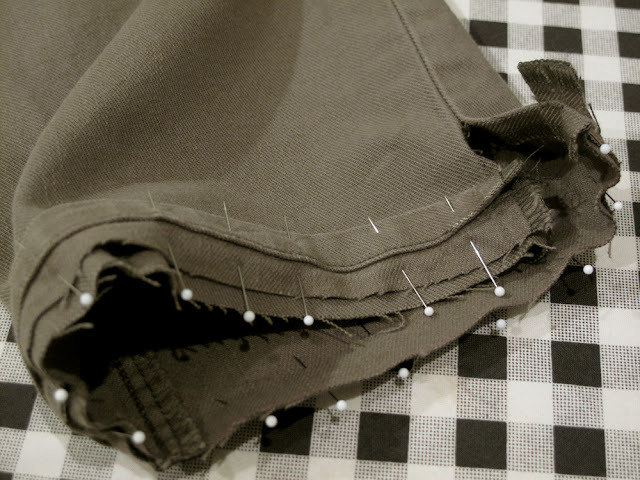 Using a seam ripper, take out the outside pant seam so that your hem piece is one long piece (no longer a tube). Next, cut your pants to the length you'd like them. Your final leg-length will be where you do your stitching plus the length of the original hem (a half inch or so), keep this in mind. 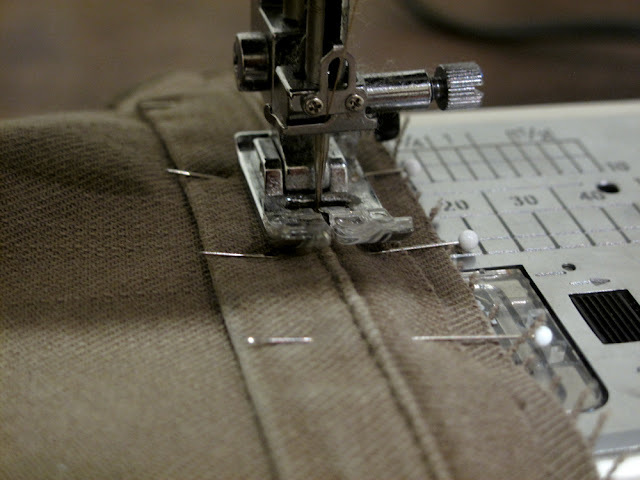 Using a seam ripper again, take out a couple inches of the outside pant seam (on the right side of the photo above). 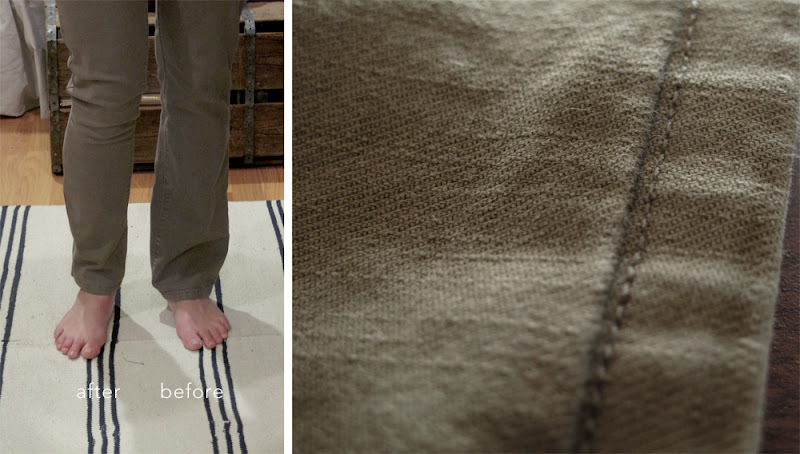 Pin the hem onto the pant leg right sides together (your pants should be right-side out) and raw edges on the same side. Match your pant's and hem's outside and inside seams. We will be stitching just below the stitching on the original hem so make sure that when you place it onto the pant leg that it is at this new stitch postion, plus the length of the original hem, that you want your new pant-length to be. Hopefully the picture makes clearer what my words fail to explain. With your sewing machine, stitch as close to the fold of the inside seam as shown in the photo above. At this point, if you want, you can finish the raw edges by trimming them and serging or zig-zag stitching. Not doing so won't really change the success of the alteration. When you've finished this, turn the pants inside-out and stitch back over the side-seam you opened earlier. Finished pants with both legs altered and my feet no longer bare. Please let me know if I did a terrible job at explaining this. No, it's a great explanation! I need to try this. The only part I'm not clear on is the bit about ripping the outside seam and then stitching it back at the end?.. Can't quite picture this step. Just found your site via pinterest - it's fabulous. I'll definitely be back.